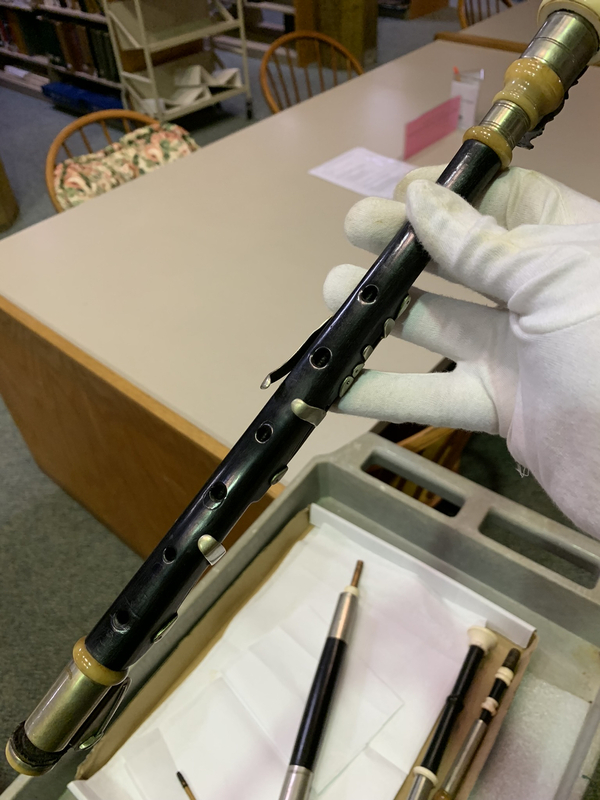 A couple weeks ago I did some research at the Mercer Museum in Doylestown, PA, and go to examine the set of Taylor pipes they have. Mercer, the museum's founder, was a big fan of Irish music and visited the Taylor workshop multiple times. 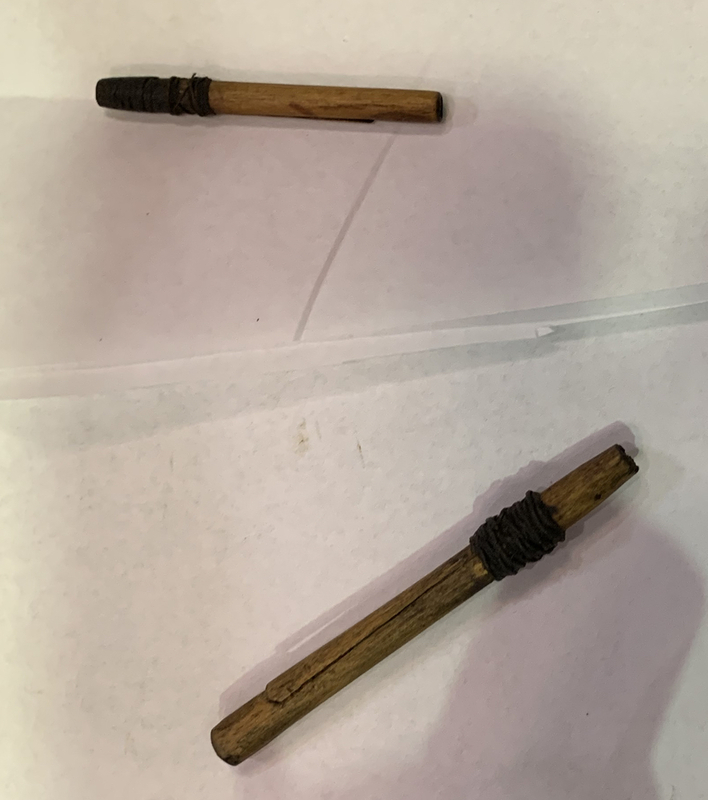 These pipes, and Mercer, have been written up in An Piobaire and so I'm not presenting anything new, but I thought a few pictures might be of interest. They were fascinating--I've never actually held or looked closely at a set of pipes before. The Taylors had a high degree of skill in multiple areas--metal work, wood turning, carving, leather work. The key mechanisms were fascinating. Very robust. The pipes are disassembled--I held them gingerly with gloves on. Thanks for the pix - very interesting...do you think the 'flatware' handle on the bellows was original? 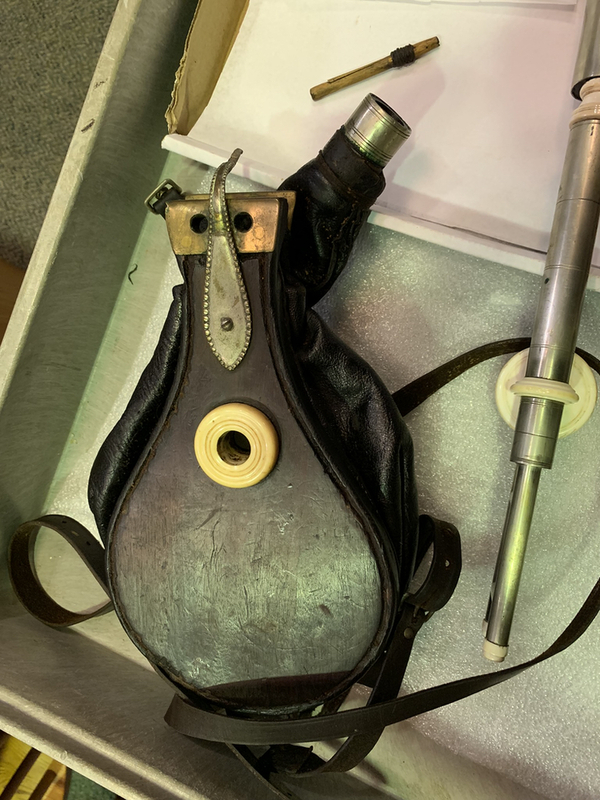 It looks like a spoon handle - what is that for if the bellows are held together by straps? (I have to wonder). 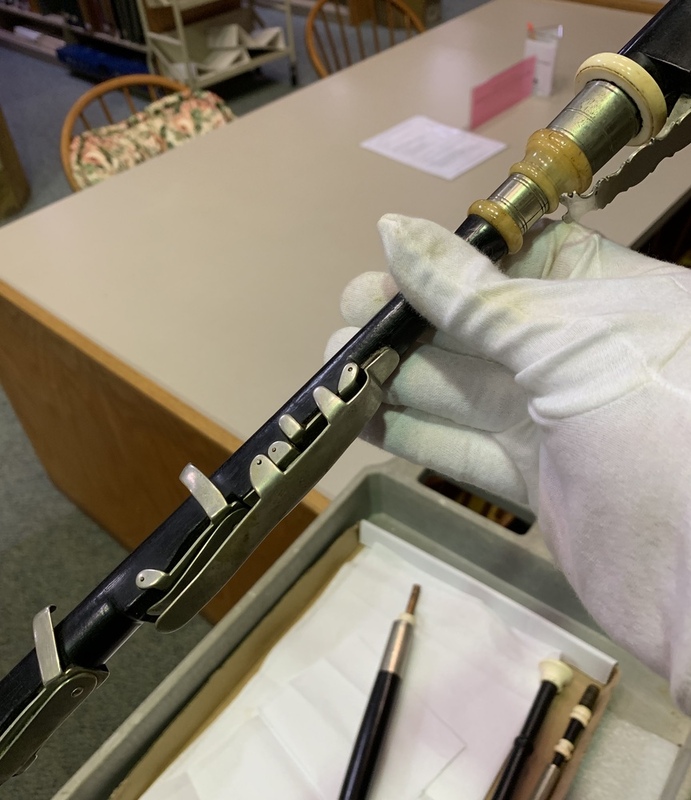 These do look a lot like George Balderose's Taylor set, which I got to hear last fall when we did the Pittsburgh version of play the u. pipes day (the official NPU name of that event slips my mind). They do sound different from the few other sets I've heard (I'm a beginner), but I don't have the literary skill to describe it. I don't remember about the bellows, pudinka, but will check if I get another chance. 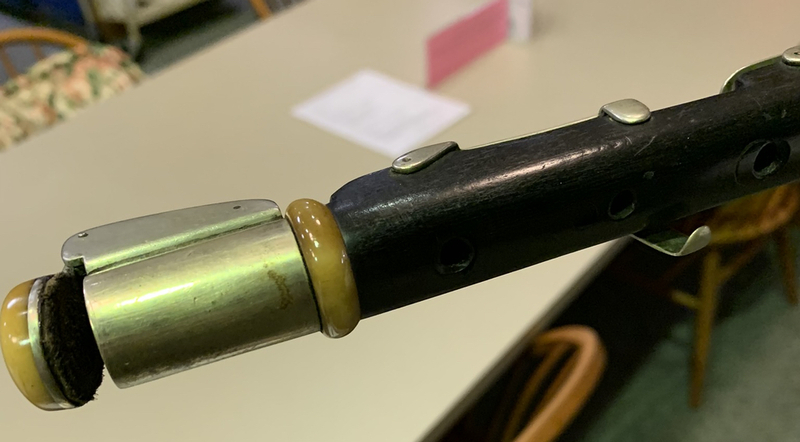 Interesting to see that the lower hand tone holes on the chanter seem to have been extensively altered, redrilled, filled, etc. I wonder if this was typical of Taylors - part of the tuning - or was it done by someone else? I saw that and wondered about it myself. I think I recall the An Piobaire article had more about the provenance of this set. It was fun seeing these and also impressive--these were clearly robust and strongly durable and made to be played. I'm working up explanations for why our family needs to get a set of pipes. My wife appears skeptical! Interesting key on the windcap/chanter top. There's something odd about the chanter. The ivory (if it is ivory) has not aged the same as the ivory on the rest of the set, including the chanter top. Might it be bone or antler or something else? There is a certain mixing of materials, isn't there. You see a touch of it on the baritone reg, too, but that's all there appears to be apart from what's on the chanter (which also appears to have a spot of what is clearly ivory as well). Rather than ivory, its translucent quality brings horn to mind. I would hazard a guess that there are two classes of 'ivory' at play here: Marine Ivory and Elephantine Ivory, or even possibly Mammoth Ivory. 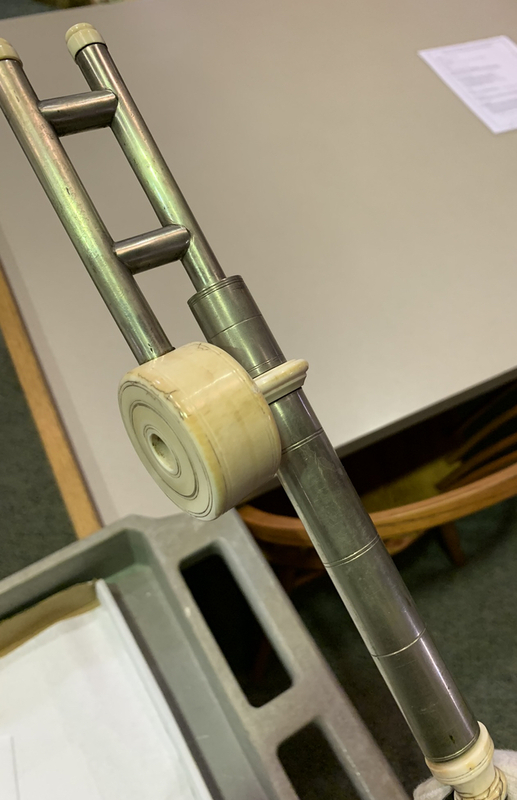 The chanter mounts are bone by the look of them. The piece of cutlery on the bellows is there to make a front attachement for the arm strap. Thanks for posting the photos. Interesting set. I grew up not far from the museum and have always intended to visit when home on family holidays but never have the time. The set is clearly the work of more than one maker, and some of the bits are definitely not Taylor. Although the chanter could well be (although the top perhaps not). The Taylors (and some other early American makers) often used bone for chanter mounts rather than ivory, or a mix of bone and ivory. Hence the different 'look' of the chanter decorations and the rest of the set, as Geoff points out. The ivory work on the reg mounts is certainly not Taylor. Much too crude, and lacks their sense of artistry. Whether that has any deeper significance for the provenance of the regs themselves is hard to tell (the mounts could be replacements). However the bass reg keys are certainly not as artful and symmetrical as one would expect from Taylor, which makes me think that reg (at least) is by another maker. The bellows have the end of a silver spoon tacked on for decoration, which (while imaginative!) I can't imagine the Taylors themselves doing. The bellows for my set are certainly cutlery free!. The old reeds are cool. Bet they still work too. Likely a combination of makers from the period. I've heard the Mercer Museum set came via Hutton, so perhaps a mix of original Taylor bits and Hutton's own work? Nice stuff.